Well, the android apps is the thing that I can't live without and I'm sure most of us are also app addicted that are willing to add more and more apps to their Android to get the most out of it. The phenomenon of mobile apps has truly changed the way we operate when it comes to customization of our devices. Years ago, you would buy a phone based on the features it came with – there was no way to add programs and tools that weren’t there to begin with. Nowadays, we sometimes take apps for granted. Android has Google Play, Apple has iTunes Store, Firefox has its Firefox Add-Ons and Chrome has Chrome Web Store as well. The concept of the app hasn’t changed very much over the years, but the delivery of apps surely has. The above mentioned app stores or markets are the native markets of their respective platforms. But now the things are changing, as the competition grows day by day, and the number of smartphone owners are increasing rapidly, it's luring the third-party players to develop their app store. And as a result of this, the well-known website Amazon.com has come up with it's own app store named Amazon App Store for Android devices. Amazon Appstore is one of those third-party markets and it’ll grant you access to a bunch of apps that you’ve never seen before. Exactly like Google Play, Amazon Appstore is an Android Application Market that contains tons of paid and free Android Apps & games that you can download right away. That isn’t to say that Amazon’s market is full of “leftovers” that couldn’t make it big on Google Play. 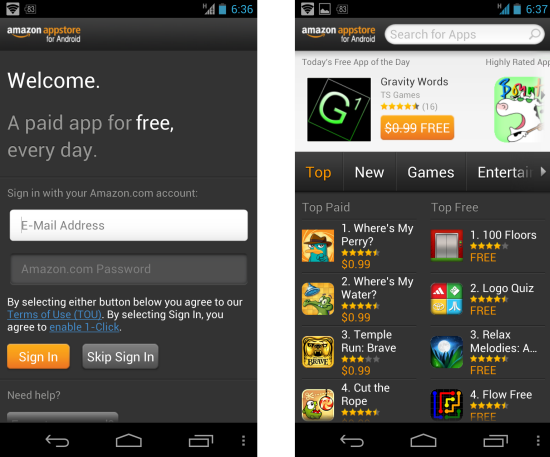 Amazon Appstore is filled with lots of great apps. You can browse through a number of categories, including Books, Education, Games, Music, Navigation, Social Networking, Weather, and more. As they say, if you need to do something, then you’ll find an app for it. And the one best thing that is worth mentioning here is the feature I love, and will lure most people to use this appstore. So what is it? 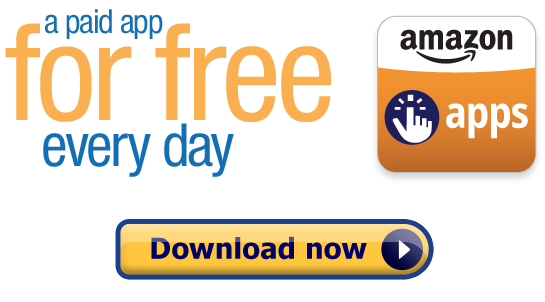 Every day, they offer great paid apps that can be downloaded for free! There’s no way to guarantee which paid app you’ll be able to download since Amazon is in charge of the selection, but as long as you check your Amazon Appstore every day, you’ll be able to find some gems along the way – and all can be had without paying a single cent. Well, Amazon Appstore is great from the user point-of view, but from the Google point-of view it is still their competitor. So, one thing is crystal clear that the Amazon Appstore App won't be available on Google Play. So you'll need to download from Amazon.com. But the process is pretty simple. 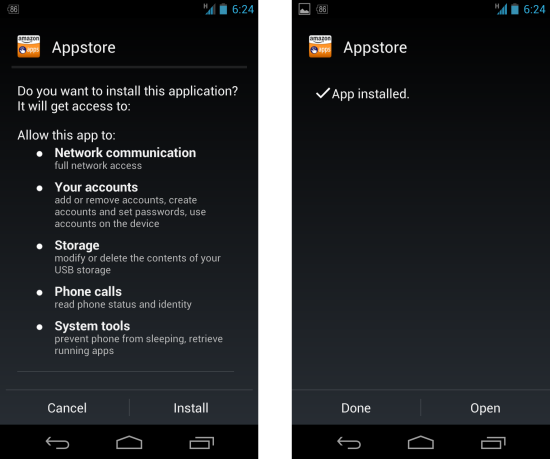 All you need to do is just to download the APK from The Download Page of Amazon Appstore and transfer that APK to your Android. And If you are on your Android, just click this link The Download Page of Amazon Appstore and click Download to download APK. Now if you've already enabled "Installation From Unknown Sources" then you can skip this step. If you haven't then read on. 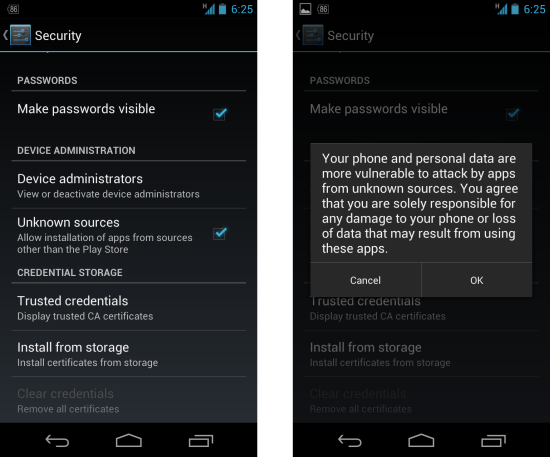 Navigate to settings and click on Security. There you can see the option "Installation From Unknown Sources". Just tick that option to enable the the installation from Third Party resources. One warning might appear but it's worth ignoring as far as you know what you are installing. Now click on the downloaded .apk file to start the installation. 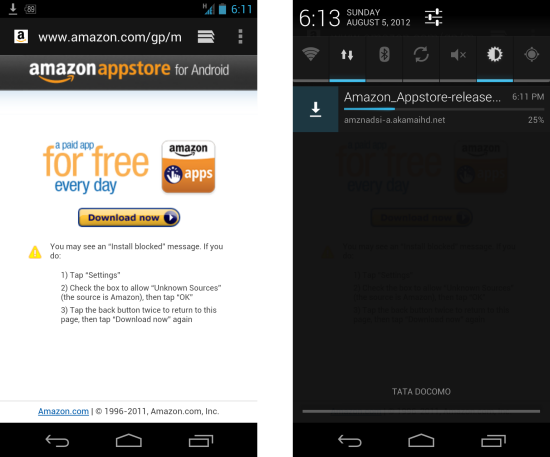 The installation will be completed in a few seconds and you have Amazon Appstore on your device! And that’s it. You’re done. From here on out, all you have to do is sign in with your Amazon account and your device will automatically be detected by the Appstore. Now you can browse through the Amazon Appstore and get some great new apps! © 2012 TechnoTravel | Computer and Technical help from your friendly TechnoTravel All Rights Reserved. Designed By MyThemeShop. Blogger Theme by BlogTipsNTricks and Right Blog Tips.